Are you a Star Wars fan? If so, are you aware that in November of 2017, Nissan held a sweepstakes contest that offered contestants a chance to win a prize of a lifetime? Although the sweepstakes have passed, there will be more like it in the future. Maybe not with a Star Wars theme, but certainly with a chance to win some great prizes. 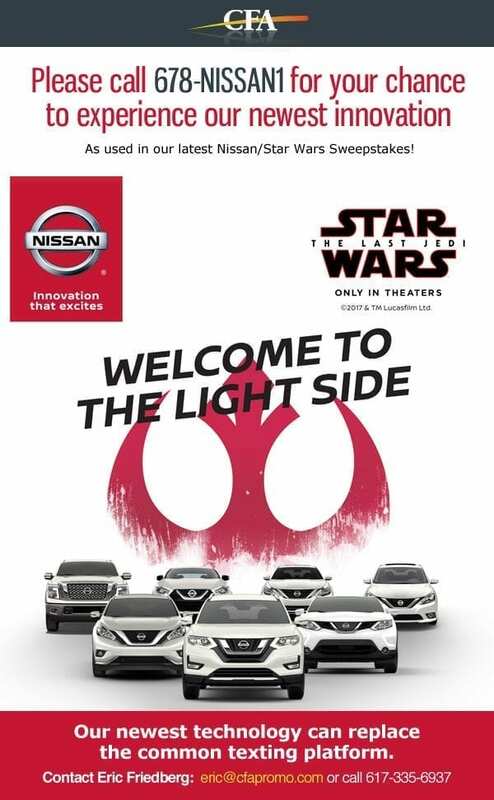 Nissan provided the theme in correspondence of the new Star Wars movie, The Last Jedi. The film premiered on December 17th in the United States and did even more to entice the Star Wars sensation that has been ongoing for decades. The sweepstakes were available for residents in the United States and the District of Columbia who were over 18 years old with a valid driver’s license in their state of residence. The sweepstakes allowed entry from November 1st, 2017-November 27th, 2017. Contestants were allowed one entry per day. Upon entry, each entrant selected from one of four vehicles to be customized. After selecting a vehicle, they entered their personal information such as phone number, zip code, full name, and email address. They then had to sign an agreement that legally bound them to the sweepstakes. Then, all there was left to do was wait and hope the force was with them. The Master the Drive Nissan Star Wars Sweepstakes gave away over $103,000 in prizes to their contestants. Grand Prize Winner: Prizes consist of one of four vehicles previously listed, a trip for four to the premiere of Star Wars: The Last Jedi in Los Angeles, California, and a Star Wars helmet. Winners could also choose to swap the customized car for a $21,000 cash reward, or the same for the trip and the helmet. Overall a $53,000 value. First Prize: Winners get a three-day trip for two to the opening night of Star Wars: The Last Jedi in Los Angeles, California. The excursion included two plane tickets, hotel costs, tickets to the movie at El Capitan Theatre, and $500 cash to spend. The total value of this prize is $4800. Second Prize: A Star Wars helmet valued at $500. The Nissan Master the Drive Star Wars Sweepstakes was a unique contest that gave away over $103,000 to 91 lucky Star Wars fans. Grand prize winner chose one of four cars customized to fit their favorite elements from the series. In addition to a trip to the premiere of Star Wars: The Last Jedi movie and some fantastic gear to top it off. Nissan promoted their company, a lucky contestant got the prize of their dreams, and the Star Wars craze lives on. If you’re interested in holding sweepstakes such as this one, contact CFA for sweepstakes management and administration.